To top off what can only be described as an exceptional year for Karen and her team, she has been crowned the Woman of the Year at the 2014 Natwest Every Woman Awards. Karen started her day at Sky News talking with presenter Eamonn Holmes and Dragon’s Den star Piers Linney about small and medium-sized enterprises, entrepeneurs and making Government business more accessible. She told viewers “I feel very priviledged to be able to provide courses that shape and mentor people, while driving them forward”. 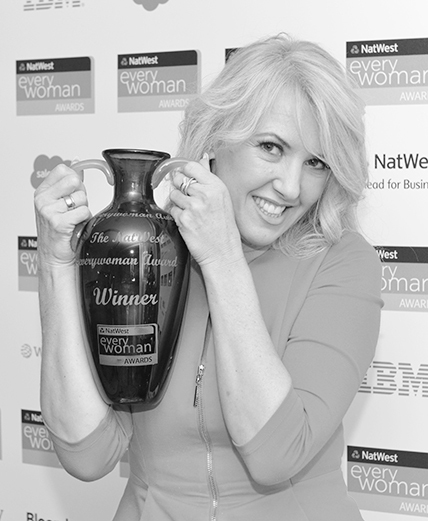 Having done a fabulous job on live television, she then dashed across the capital for the 2014 NatWest everywoman Awards. To her surprise and delight she was presented with the most coveted award of them all – the Woman of the Year. It encompassed all her achievements as an entrepeneur with her empire that encompasses Karen Betts Professional and Nouveau Beauty Group, including a pioneering medical tattooing enterprise, several leading cosmetics brands and a salon training business. “This woman is phenomenal”, judges commented when agreeing she had led her companies to outstanding success, growing them from a small office in Yorkshire to an international team of 182 employees with a turnover of £7 million. At a glittering ceremony at The Dorchester Hotel in London, hundreds of inspirational women congregated to celebrate the success of female-owned businesses across the country at the Natwest everywoman Awards. Now in its 12th year, the Awards has become the defining event for Britain’s female entrepreneurs. Today’s ceremony reveals the stories of individuals, whose qualities and acumen have driven their success, applauding their achievements and creating inspiring role models. Significant progress has been made to increase the influence of women in business and the UK now leads the way in Europe for entrepreneurship.